A small tree/ large shrub (Cornus mas) from Central and Southern Europe, quite at home in Britain. 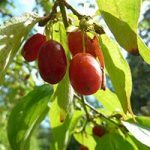 The cherry-like fruits are edible (raw, cooked or dried) with a plum flavour when fully ripe; flowers are used as a flavouring and seeds have been used to make a coffee. Tolerates deep shade, though fruits best in sun; hardy to -23°C. Best fruiting is by cross pollination with a different selection.